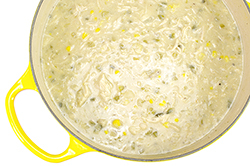 Some might argue that a “white” chili is not a chili, but given the broad definition of “chili” that we’ve chosen to use, it qualifies in our book! 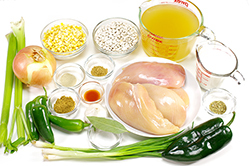 Whatever the categorization chosen for this soup, it will include the word “delicious!” Using fresh peppers and aromatic onions and garlic, a chili-style mire poix is made, and boneless chicken breasts poach in the richly-flavored broth until tender. White beans and corn round out the mild chili profile. 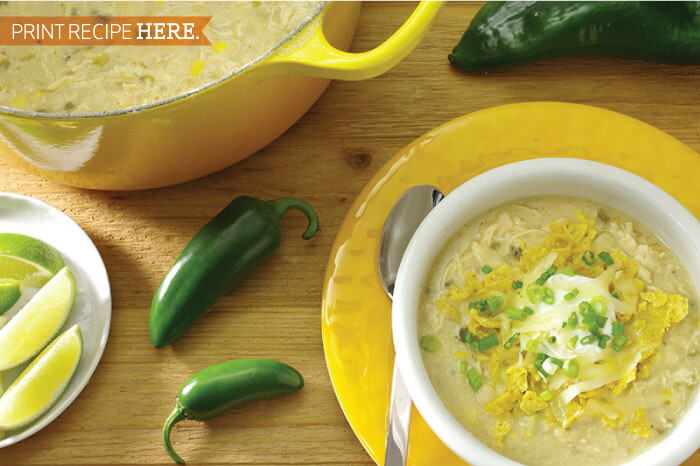 You may choose to have the soup thin – more broth-style, or thicker – more stew-style. For the latter, simply puree half the beans for a lighter and easier thickening. Don’t be afraid to load up on the garnishes; they add a lot to the final presentation and taste. 1. If using dried beans, soak overnight in a pot filled with water. Drain, then refill the pot with fresh water. Bring to a boil, then turn the heat low to a simmer for about 1 hour, or until the beans are soft and easily squished between the fingers. 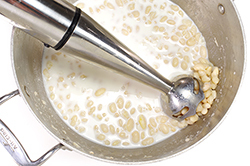 If using canned beans, rinse, drain, and set aside. 2. 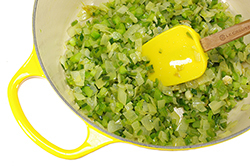 In a large pot (5.5 quart size), heat the olive oil and add the diced onion and sauté for 2-3 minutes. 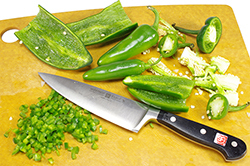 Add the diced peppers and celery. Continue sautéing for an additional 2-3 minutes or until the onions are translucent and the peppers tender. 3. Add the crushed garlic, and spices (cumin, coriander, oregano, salt, white pepper) and sauté for another minute to bloom the spices. 4. Add the broth, bay leaf, and chicken breasts. 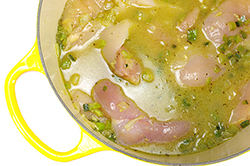 Bring to a boil, then lower the heat to a simmer for 20-30 minutes or until the chicken is fully cooked. 5. 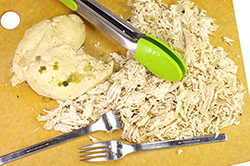 Remove the chicken breasts from the broth to a rimmed pan or cutting board and shred apart with two forks. Return the chicken to the broth. Add the corn kernels to the pot. Bring to a low simmer. 6. Add half of the reserved beans to the chicken and broth. Puree the other half of the beans with the milk in a blender, or in a deep bowl with an immersion blender until smooth; add to the chicken and broth. 7. Stir in the hot sauce and scallions when ready to serve. Adjust seasonings to taste. Serve with your favorite garnishes.